I plan on continuing at least for a year or so. It's not always easy, but it's definitely worth it. 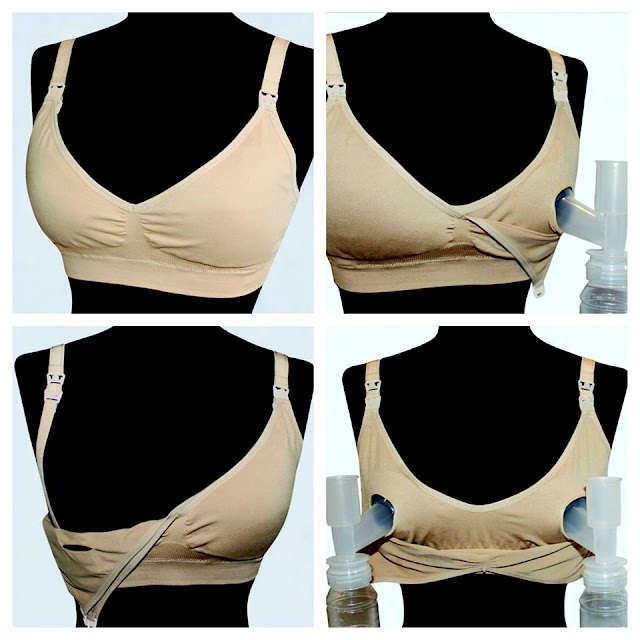 I've always wanted to find the perfect nursing bra and the one I was sent to review is awesome. It is a nursing AND pumping bra. The bra line combines the best of traditional maternity bras with an improved feminine shape and custom fit for better comfort. BeliBea bras incorporate specific design features to ensure every mother’s all-day comfort, including a seamless stretch fit, plush-lined adjustable straps and a ribbed band to provide flexible support as well as a v-neck scoop and center ruching to maintain a feminine shape. Nourish by BeliBea also comes with removable pads between the cup panels that offer extra support, comfort and shape. I took a picture of it like this because I just wanted to give you an idea of how incredibly soft it is. I honestly thought that it would have no way to support my chest due to this. I was so wrong. I'm serious. It is by far the softest bra that I've ever used, even softer than my comfy sports bras. It is soft, but it still offers support and a nice lift and yes some cleavage. I'm still surprised at this. It is as comfortable as I could possibly want a bra to be during these next few months. I love how it has two clasps that are easy for me to open and close when I either nurse or need to pump milk. It also has a little bit of padding in it which helps provide extra comfort and a layer between my shirt and chest. Also good in case I leak and forget to use my nursing pads! I would like to own more than one of these in other colors. I recommend this to all the other nursing moms out there looking for comfort and convenience.